Taken as a hot infusion, Catnip promotes sweating and is beneficial for colds, flus, fevers, and infectious childhood diseases. It is soothing to the nervous system and calming to the stomach. It aids with flatulence, diarrhea, and colic. It is sometimes used as an enema to cleanse and heal the lower bowel (use in diluted form). Catnip helps to prevent miscarriage and premature birth as well as allays morning sickness. 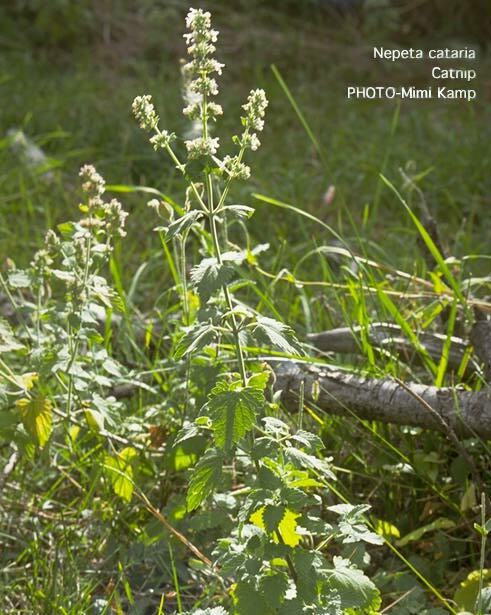 Catnip, a member of the mint family, is a harmless "high" for felines. Although many cats will eat it, scientists say they're reacting to the smell rather than the taste. Felines bite, chew, rub against, and roll in catnip to release the volatile oil trapped in the leaves. Catnip is harvested when this essential oil production reaches its peak, and leaves and fragrant flowers are carefully air-dried to preserve essential oils at their best. Catnip, Nepeta cataria, is a mint family member said to be an import that went wild and now flourishes everywhere. It grows about 2' tall. The leaves are downy above and below, a little larger than peppermint leaves. By the 1890's, Ojibwe women were using it. It had a Native name, Gajugensibug, and was said to be a good tea to drink to bring down fevers, as well as pleasant-tasting. A hardy, upright, perennial herb with sturdy stems bearing hairy, heart-shaped, grayish-green leaves. The flowers are white or lilac, 0.25 inch long, and occur in several clusters toward the tips of the branches. Native of Eurasia, naturalized in North America. Cultivation and Propagation: It is easily cultivated in any garden soil, with little care, as the plant does not require the moisture that most mint plants need. Plants should be grown from seed sown where they are going to stand. Bruised or recently transplanted plants are likely to be eaten by cats unless protected. The seed should be sown very thinly in rows 20 inches apart and the seedlings thinned out to 20 inches apart in the rows. It requires almost no care except occasional weeding. A bed will last several years. It can also be propagated by division of the roots in spring. Harvesting: The herb is harvested just before flowering in middle to late summer on a dry sunny day and in late morning when all dew is gone. Drying should be done carefully. The leaves are stripped from the stems and dried as quickly as possible with good ventilation out of direct sunlight, or in an oven at 150 degrees Fahrenheit to avoid losing much volatile oil.